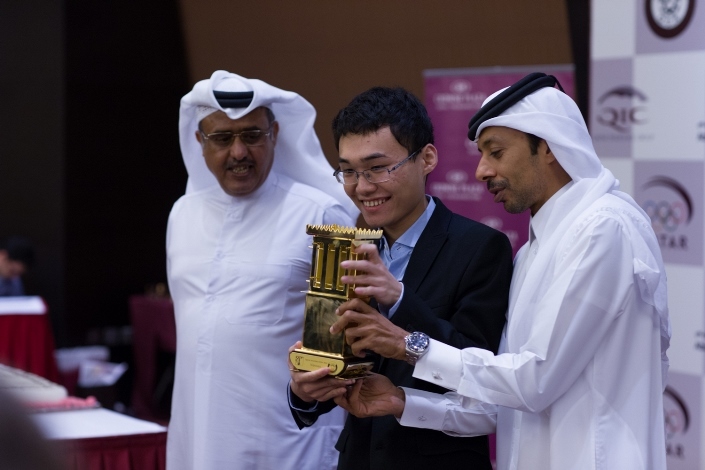 20-year-old Chinese Grandmaster Yu Yangyi has won the Qatar Masters Open after beating ex-World Champion Vladimir Kramnik in today’s final round. You could call it the Curse of Caruana. 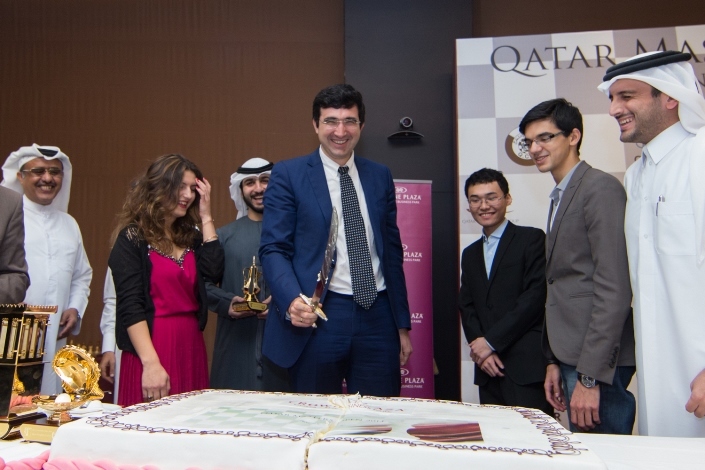 Both Anish Giri and Kramnik put together streaks of six wins in Doha, but just when they had a chance to match (at least numerically) Caruana’s seven in St. Louis they fell to defeat. 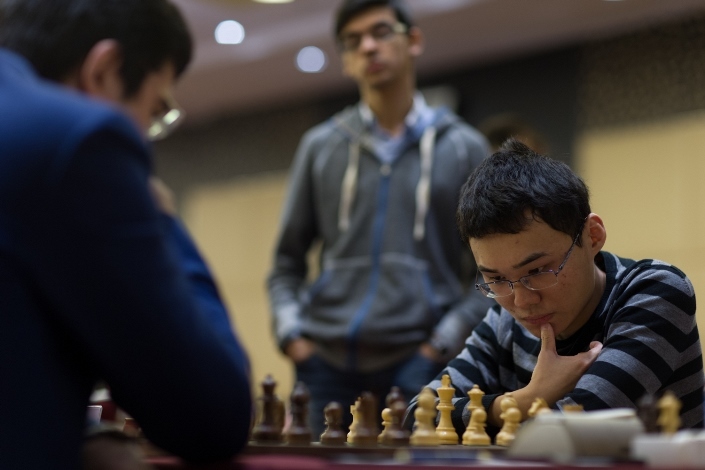 Giri caught Kramnik on 7/9 and even snatched second place bragging rights, though both players take home $12,500 for their efforts, while Yu Yangyi gets $25,000 for his 7.5/9. Vladimir Kramnik’s task was simple – draw with the black pieces and head to the London Chess Classic as the Qatar Masters Open Champion. His opponent, however, had beaten top seed Anish Giri the day before, posted the best performance of any player in the 2014 Olympiad and had unfinished open tournament business after missing a straightforward win that would have guaranteed him at least $50,000 from the Millionaire Open. He also won the pre-game contest... "Is that Kramnik with a "K"?" The first post-game interview with Daniel King was pure comedy gold, since it soon turned out that the young Chinese player knew barely a word of English, leaving Daniel to supply the answers as well as the questions, although Yu Yangyi did manage, “I am English no good,” at one point. An interpreter was later provided, which took some of the fun out of the proceedings. We still have a distance between us and the top elite chess players in the world. We can only strive for the goal for now. I need to work on my studies, including my English! You can read more about Yu Yangyi’s career in his chess24 profile. So it was a bitter end for Kramnik, but he could still look back on a much more successful tournament that you could have predicted after his draws in the first two rounds. At least no-one can cut a cake quite like he can! Baskaran Adhiban's 24th place may seem modest, but just look what it did to his rating! Ok, sadly it seems this may have been a brief anomaly. So that’s all from the inaugural Qatar Masters Open, which certainly whetted our appetite for more. The word on the street is that the organisers are planning to attract even more of the world’s very best players next year. It should be good! 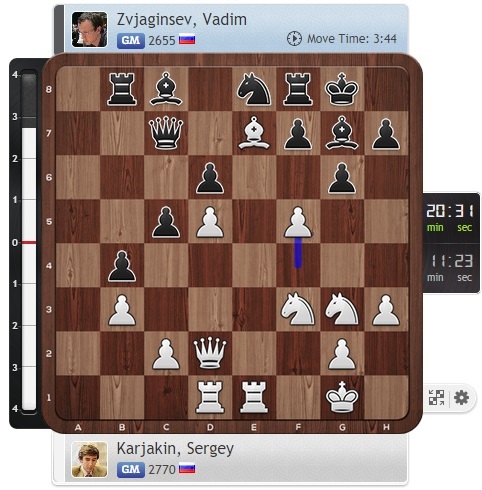 So Karjakin is back on -1, with Peter Svidler and half the field, a full two points behind Igor Lysyj on 4.5/6. In the women’s event we had the first draw in three rounds, and it was vital. 16-year-old Aleksandra Goryachkina retained the lead after holding on a pawn down against Natalia Pogonina. The other four games were, inevitably, decisive. Alisa Galliamova joined Goryachkina in the lead on 4.5/6 by defeating ex-World Champion Alexandra Kosteniuk. Defending Champion Valentina Gunina, meanwhile, is only half a point off the lead, after winning her last four games to make her two opening defeats a distant memory. 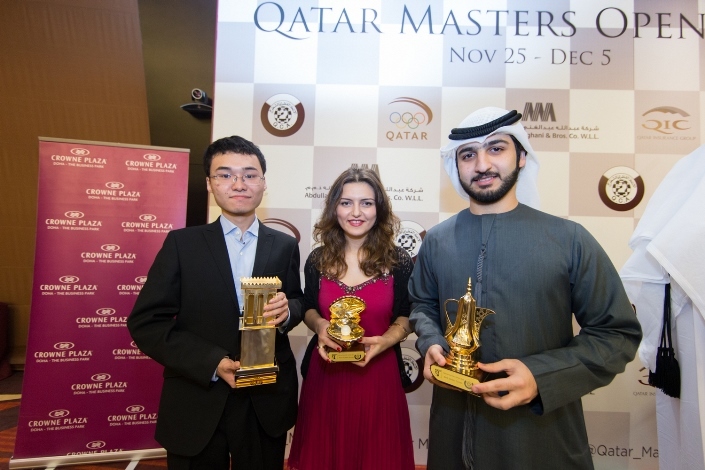 Anish Giri - in the footsteps of Caruana and Carlsen? 2014 Russian Championship: Can Svidler make it 8?